When I saw that the Who had recently performed a couple of classics on the Tonight Show with Jimmy Fallon I immediately forwarded the link to Stephen Macaulay. Mac has a long history with the Who, dating back to seeing them at Cobo Hall in Detroit when he and the band were all scruffy young guys. He’s been quite vocal over the years on his disappointment over what they have become. -ed. Imagine listening to “I Can See for Miles” with your eyes closed. Wouldn’t you imagine that this was a good cover band, but something sounds slightly off on the lead vocals, as though the singer was trying too hard or having too difficult a time? And then you open your eyes and watch. 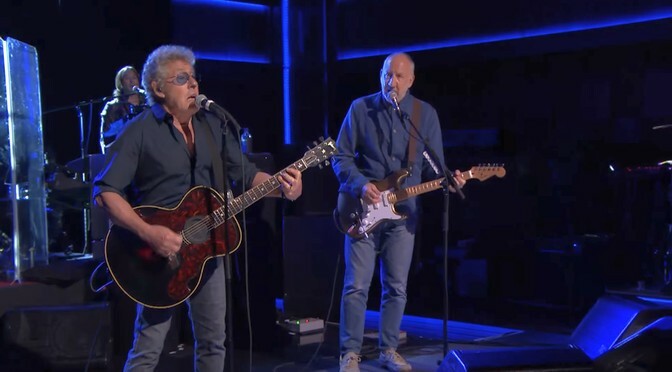 But what the hell is Daltrey doing with that acoustic guitar? Does he really think that Pete and Simon can’t handle it? Or is it that he doesn’t quite have the confident moves anymore and so the guitar becomes a prop that keeps him from having to make those moves. Plus, with Pete teasing and doing the windmills is physically distracting. Then “You Better You Bet.” Better, I think. Who are those people? Not The Who. There are The Remainders. And More. And I noticed that when Pete was leaning down over his guitar, getting ready for a bit of a solo and was away from the mic, his brother’s voice sounded exactly like his. Convenient to have an able member of the Townshend family on board. Especially a 56-year-old baby brother (Simon was age 7 when “I Can See” came out). One thing of a somewhat nostalgic aspect: Marc Bolan died in ’77. We can only hear sounds of old T Rex. Hmm. . .might that not be better vis-à-vis the so-called The Who? Geez, Stephen. Roger and Pete have earned their agitude. Give them a break!